Whether they are made at home or ordered at a restaurant, sweet potato fries have always been a favorite around here. Now that it doesn’t matter if the oven heats up the whole house, we’ve been trying new ways to enjoy sweet potato fries. These buffalo sweet potato fries take regular baked sweet potato fries to a whole new level. Once the cheese is slightly melted and the hot sauce has soaked in, drizzle with more hot sauce, sprinkle with more cheese and top with some fresh parsley or chives. If you have to take pictures before consuming, good luck. . .it’s really hard to wait! As soon as these pictures were taken, my husband promptly grabbed a plate and headed off to the living where he finished them off and wanted to know how much I wanted to eat of the other plate! These buffalo sweet potato fries are great for snacking on while cheering on your favorite team or as a side dish to spice up your dinner. Either way, this easy recipe will soon find it’s way into your regular menu rotation! Preheat oven to 400. Spray baking sheet with non-stick cooking spray or line with a baking mat. In a small bowl, whisk together corn starch, salt, pepper, onion, and garlic powder. 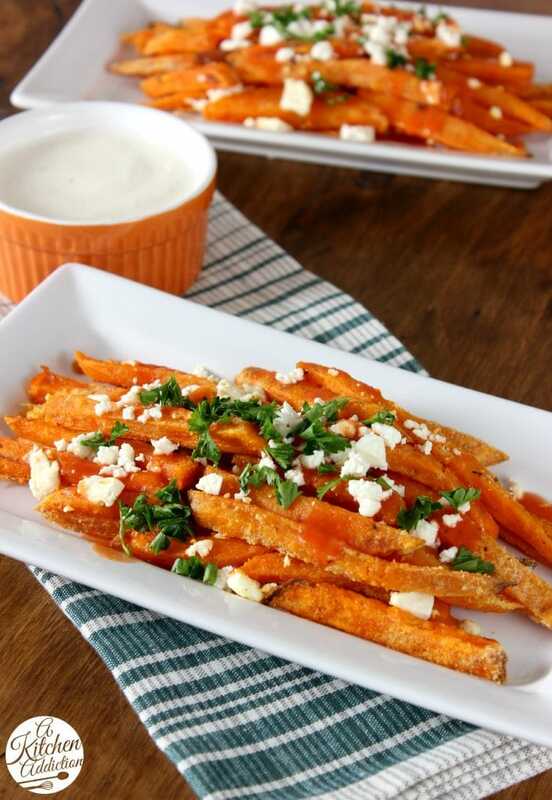 In a large bowl, toss sweet potato fries with olive oil. Sprinkle with cornstarch mixture and toss. Spread in an even layer on baking sheet. Bake for 20-25 minutes or until soft and starting to turn golden brown. Return fries to bowl and toss with hot sauce. Return to baking sheet in an even layer. Sprinkle with ½ cup cheese. Sprinkle with remaining ¼ cup cheese. Serve with a drizzle of hot sauce and ranch for dipping. This recipe is inspired by Rachael Ray. Oh my, I wish I could eat these! They look incredible! Sweet potatoes are so good! I prefer them over regular fries and Olivia likes them too. I’ll take both plates too! yum. Oh my goodness! Something tells me I’d be unstoppable with these scrumptious fries… LOVE that spicy flavor with the blue cheese! Oh man, I love sweet potato fries. I’m pinning this! Oh yes yes yes! I LOVE these! 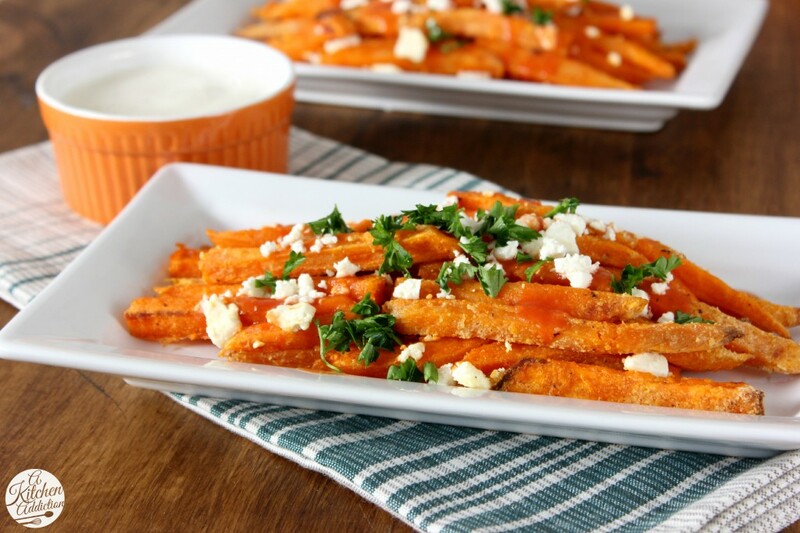 Sweet potato fries are a huge favorite in our house – but with all these awesome topping?? Even better! These fries look incredible! 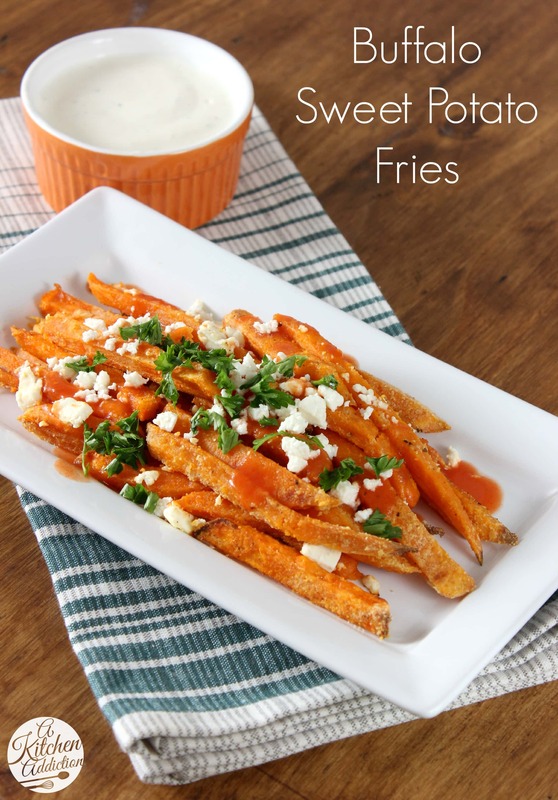 We love sweet potato fries but oh my, these sound awesome with the hot sauce and all those toppings! Oooh I love sweet potato fries AND feta cheese. Will have to give these a try sometime, for sure! I’m obsessed with sweet potato fries and I absolutely love buffalo and blue cheese. I need to try these soon! These look dangerously good! I think I would choose feta too. Yum! Sweet potato fries are already kind of dreamy but these are, like…dreamy SQUARED. My fiance would love these! I could seriously embarrass myself eating these in a public setting! These look and sound scrumptious! I love jazzed up fries and buffalo sauce makes anything delicious! Sweet potatoes are my obsession right now, and I could plow through a whole pile of these. That plate of fries would disappear around me. YUM! Two of my most favorite flavors combined into one irresistible french fry…what’s not to love?